The finale of the reality television show ‘The Bachelorette’ definitely had all the elements of a fairy tale happy-ever-after ending: a beautiful woman, a dashing young man, an exotic backdrop, a romantic proposal of marriage…and a gorgeous 3.5-carat diamond engagement ring thrown in for good measure. 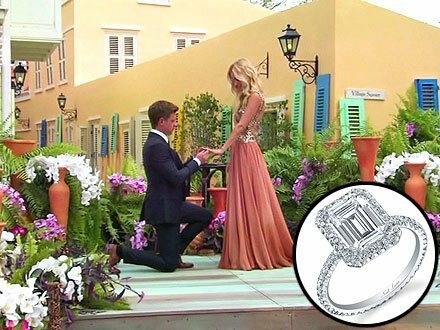 Emily Maynard, single mother to a 7-year old and the star of the TV series, has created ‘The Bachelorette’ history by getting her ring finger adorned with a 2.5-carat emerald-cut diamond; the biggest yet that a Bachelorette has received. It has 87 smaller round-cut diamonds surrounding the main stone set on a slender band, providing a total of 3.5-carats. The dazzling piece of diamond jewelry is custom made by celebrity jewel designer Neil Lane, who does all the jewelry for The Bachelor franchise. Industry insiders and celebrity engagement-watchers peg the ring’s retail value to at least $150,000. Many have been comparing Emily Maynard’s sparkling new diamond jewelry to that of actress Reese Witherspoon’s, a 4-carat Ashoka diamond affair with a similar cut and settings. Prior to the big finale, jewelry and celebrity sites leaked teaser photos of some of the possible ‘The Bachelorette’ diamond engagement ring designs. Included is an emerald-cut, halo design that looks a lot like what Emily Maynard received, and a variation of it in a monarch cut. Also featured were a vintage and an Art Deco design, but with price ranges falling way below what the dazzling diamond jewelry in the just-concluded series racked up. As for the man who slipped it on her finger while on bended knee? He is none other than entrepreneur Jef Holm. Jef Holm bested Emily’s other suitors including close contender Arie Luyendyk Jr., a race car driver, during the ABC series finale that a lot of viewers favored. The proposal unfolded in sun-kissed Curacao, with the Bachelorette pronouncing Jef Holm as both her “soul mate” and “the perfect person” to spend her life with. Their courtship was a story that climaxed with Jef Holm proclaiming for television audience how in love he is with Emily Maynard, and how he wishes to be part of her and her daughter’s life. The three were shown walking off hand in hand as the show concluded.